Firstly, check whether the power line and plug board are intact, whether the power switches are turned on. Judge whether the machine is powered on by the rotation of a fan. If everything is normal but the oscilloscope cannot start still, please contact the after services. There is no signal waveform on the screen when collecting signals? 1. Check whether the detector is normally connected to the signal wire. 2. Check whether the signal wire is normally connected to the BNC (namely channel connector). 3. Check whether the detector is normally connected with the object under measurement. 4. Check whether the object under measurement produces a signal (Signal channel can be connected with the fault channel to find out the fault). 5. Collect the signal again. 6. Check the state of the trigger mode. There is a waveform display, but the waveform is not stable? 1. Check whether the source channel of trigger panel conforms to the actual signal channel. 2. Adjust the LEVEL trigger knob by hand to observe whether the waveform is stable. 3. Use the AUTO to adjust waveform automatically, observe whether the waveform is stable. 4. Adjust the time base to eliminate the false wave interference. Measured amplitude is not accurate? 1. Check the unit of source amplitude, amplitude of oscilloscope auto measurement is Vpp, namely the the difference between maximum value and minimum value. It’s easy for users to confuse it with Vrms, namely the effective value. For example, we often say the electric supply is 220Vrms, but its actual Vpp is more than 600V. 2. Oscilloscope is not a precise measuring tool, there is a certain quantization error on the longitudinal axis according to the number of chips used. Large distortion for high frequency signal? 1. The closer the measurement signal is to the upper limit of the of oscilloscope bandwidth, the greater the distortion. Generally, signals with little distortion can be obtained with the oscilloscope whose bandwidth is more than five times of signal bandwidth. 2. Improper detector selection may lead to waveform distortion. Firstly, bandwidth of the detector shall be larger than the signal bandwidth, it prefers to be more than five times of signal bandwidth. Secondly, if the detector is divided into two levels, their bandwidths should not be the same, that of the 1X level is generally 6MHz-10MHz, while 10X level is the largest bandwidth for detector. 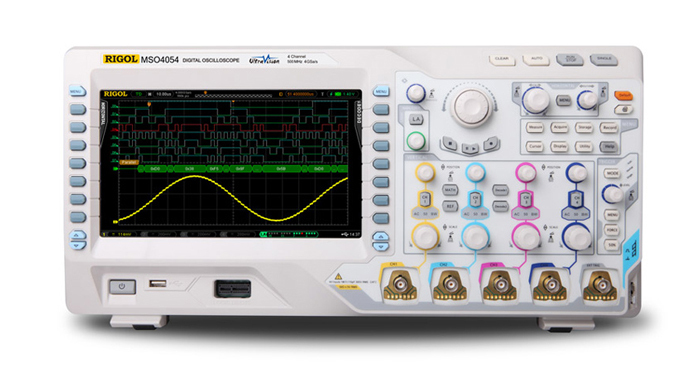 ATO.com provides you bandwidth range from 70 MHz to 1 GHz RIGOL digital oscilloscope including Digital (DS models) and Mixed Signal Oscilloscopes (MSO models). Buy one low cost oscilloscope now. How to Solve Displacement Sensor Failure? How to Maintain a Gas Flow Sensor?